I’m having such a fail week! I’m blaming it on Day Light Savings (along with a few other personals), though – it’s getting dark way too fast, making my day turn upside down – definitely not use to it, yet. As it is Tuesday though, and missing 2 Tasty Tuesdays in a row, I need to get cracking and make it up to all of you with a sweet treat today. Today’s edition: Candy Coma! Today’s post is not exactly going to be ‘fashion forward’ (aside from the rtw outfits I put together you will see below), but more-so avant-garde, when you’re in the mood for something extraordinarily out of the box, when you need inspiration for a photoshoot, or you’re just in a really energetic, happy, colorful mood! The first thing, or person rather, that comes to mind when thinking about candy (aside from Halloween, I suppose), is Betsey Johnson. If you’re a fan of hers, you know the aesthetic she chooses when designing her collections. If not, Betsey is known for her feminine, colorful, and whimsical designs; she truly brings out energy and happiness through her designs. I could go on for ages talking about Betsey Johnson, telling you bits and pieces about her from the day she opened her first boutique ‘Betsey Bunki Nini’, to this day with her labels Betsey Johnson and Betseyville, to her signature cartwheels at the end of each catwalk at her shows. I’ll save that for another post, though. Today, the reason I chose her as my muse for Candy Coma is because of her incredible use of bright colors and patterns, cute and candy/dessert embellished jewelry and accessories, and the overall exciting and energetic vibes showcased by her designs. Now that you’ve learned I’m obsessed with Betsey Johnson… (I know, I tend to get somewhat off topic – I’ll try to cut that down! 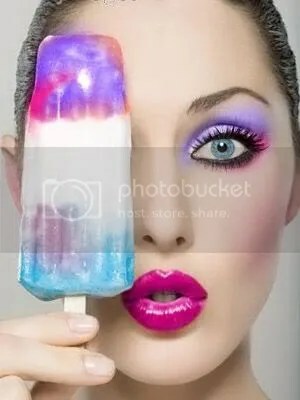 Hehe) today’s show and tell contains 3 parts: candy coated photoshoots, stylish ways to wear bright & bold colors, prints and patterns, and an edible homemade treat – rock candy! 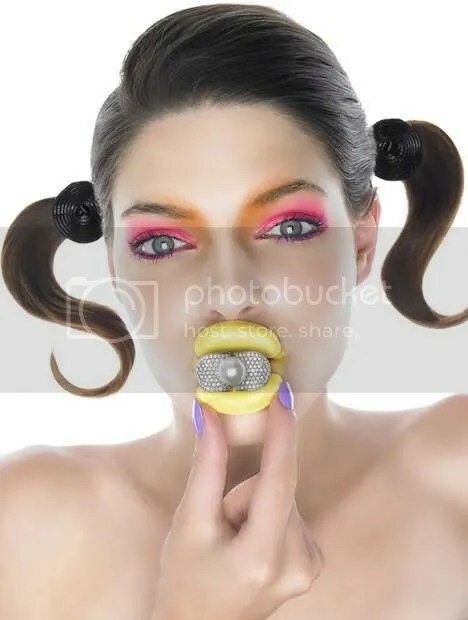 If you’ve ever seen candy-coated photoshoots, the models (for the most part, in my opinion) appear too sultry and the candy becomes quite tasteless. 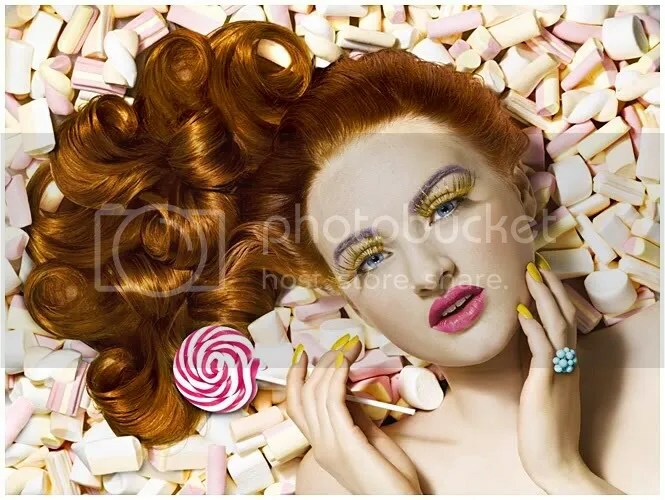 Today, I will show you what I feel are tasteful, glamorous, and beautiful candy-filled photoshoots. 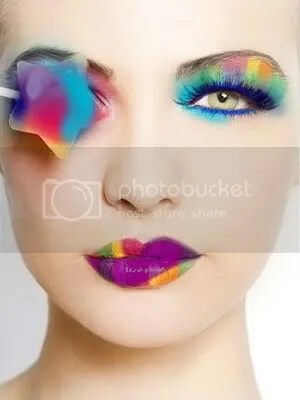 To be honest, I tried to do a tutorial to show you how to do some of these colorful makeup looks, but I had a hard time perfecting the look, and the pictures did not turn out so great. I will definitely keep trying though, and let you all know when I’ve perfected the look, or at least completed one that I feel you will benefit from! 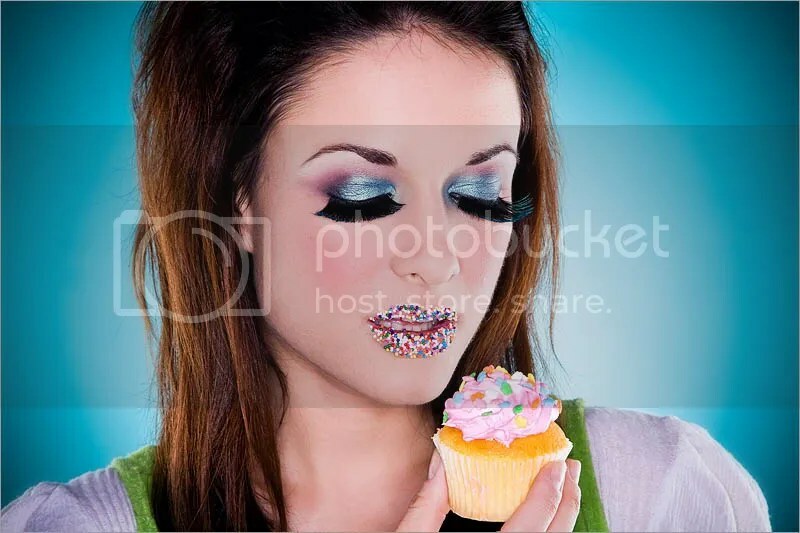 For now, I hope these pictures will inspire you to try some beauty looks of your own, whether you decide to go all out with candy/dessert, or take the bright colors as inspiration for a colorful, fun face! Some are silly, while others more beauty-focused – take your pick! 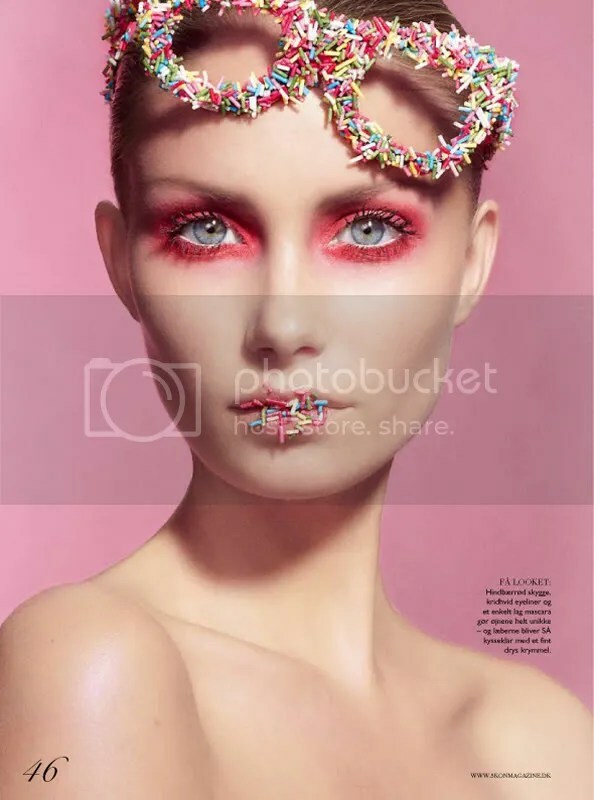 For those days where you’re feeling super bright and energetic, but don’t want to (of course) look like you’ve just dipped yourself in a bowl of sprinkles, you can still experiment with bright and bold make-up that will make you look super glamorous and beautiful. To make your eyes pop, use light color shades (white works wonderfully), on the inner corners of your eyes. When sporting bright colors on a normal day, you don’t want to mix and match too match – pick either eyes or lips, not both. However, an exception to this (like in the first photo below), is to use pastels/lighter colored bold shades (if that makes sense, I hope?) You’ll notice below the color combination used on eyes and lips (or solely on one and not the other) that work beautifully to compliment the facial features and truly make them ‘pop’! First, pick one or two garments in your outfit that you would like to colorize – for example, choosing a pair of flashy colored tights means you should keep the rest of your outfit neutral (like black and white, for instance); or, if you’re daring, you can try pairing colors that go well together, such pink and red or blue and purple, and wear one as a top, and one for the bottom. I hope that makes sense! Homemade DIY Treats: Rock Candy! Heat the mixture to a boil, stirring constantly. You want the sugar solution to hit boiling, but not get hotter or cook too long. If you overheat the sugar solution you’ll make hard candy (hooray! you’re done with that ;p), which is nice, but not what we’re going for here. Stir the solution until all the sugar has dissolved. The liquid will be clear or straw-colored, without any sparkly sugar. If you can get even more sugar to dissolve, that’s good! If desired, you can add food coloring and flavoring to the solution. Mint, cinnamon, berry, or lemon extract are good flavorings to try. Set the pot of sugar syrup in the refrigerator to cool. You want the liquid to be about 50°F (slightly cooler than room temperature). While the sugar solution is cooling, prepare your string or kebab stick. Tie it to a pencil, knife, or other object that can rest across the top of the jar, so the string/stick hangs in the center of the jar, not touching the sides or bottom. You want to ‘seed’ the string/stick with crystals so that the rock candy will form on it rather than on the sides or bottom of the jar. There are two easy ways to do this. One is to dampen the string/stick with a little of the syrup you just made and dip the string in sugar. Another option is to soak the string/stick in the syrup and then hang it to dry, which will cause crystals to form naturally (this method produces ‘chunkier’ rock candy crystals). Once your solution has cooled, pour it into the clean jar. Suspend the string/stick in the liquid. Set the jar aside. Check on your crystals, but don’t disturb them. You can remove them to dry and eat when you are satisfied with the size of your rock candy. Ideally you want to allow the crystals to grow for 3-7 days. You can help your crystals grow by removing (and eating) any sugar ‘crust’ that forms on top of the liquid. If you notice a lot of crystals forming on the sides and bottom of the container and not on your string/stick, remove it and set it aside. Pour the crystallized solution into a saucepan and boil/cool it (just like when you make the solution). Add it to a clean jar and suspend your growing rock candy crystals. And there you have it – colorful, deliciously sweet rock candy! It may require a lot of steps and patience, but I assure you it is not hard and it’s well worth the try! tons of delicious and colorful treats. i really loved looking at this post! it was so bright, and it made me want to experiment more with colors. keep it coming please!! !